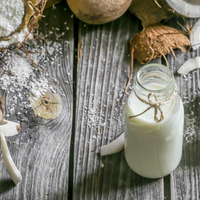 Profile: Luxurious and voluptuous fresh coconut milk. Luxurious? Well, it kinda is since the ingredients can be a little expensive and hard to get, especially FA Milk in the States and overall FLV flavours in Europe. The recipe itself it's pretty self-explanatory and simple. All the ingredients make sense. So there you go! FA Milk - If you want milk like straight milk, this is it. Not to sweet, not overwhelming with the dairy note and makes your mouth with that feeling when you drink a cup of fresh milk. FLV Sweet Coconut/FLV Coconut - Sweet Coconut it's an super versatile flavour. In this recipe creates this fresh and authentic coconut flesh and also have a great watery content. FLV Coconut on the other hand, it's super thick almost like coconut oil. Buttery and rich and obnoxious strong as a flavour so be careful using this. Just a few drops is enough for this profile to make the Coconut shine. WS-23 - I normally say this is optional but in this recipe, I recommend to include this. It brings more authenticity and makes the overall experience much more enjoyable especially in the summer and turns the vape experience lighter. This can be vaped right away but 2-3 days of steeping it's gonna turn the recipe much better. Shoutout to @hashslingingslashur for his Leche de Coco recipe, which is a great and ingenious recipe. This recipe is the property of Katumbas and released under the CC Attribution-Noncommercial 4.0 license. You may not copy, derive or commercialize this recipe without following the terms of this license or the explicit permission of the creator.